This entry was posted in Online and tagged 1917, 24/7, anniversaries, Brunner Mond, censorship, centenary, Docklands, explosives, history, Illustrated London News, London, NewsBank, newspapers, online, reference, research, Silvertown, Times Digital Archive, TNT, World War I, WW1, WWI. Bookmark the permalink. This was very interesting to read. Thank you. 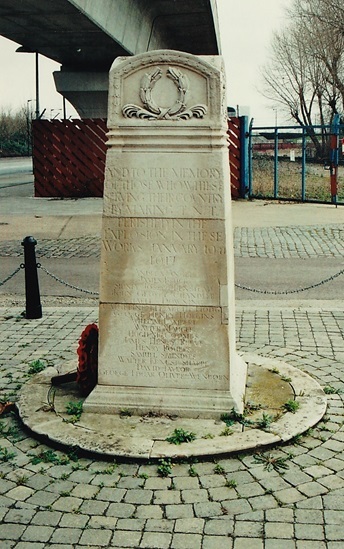 You may be interested to know that the Brunner Mond memorial has recently been moved to a position closer to the centre of the Royal Wharf development. I haven’t seen it yet in its new location; the last time that I checked, it was still by the DLR line, but protected under a large wooden box. On contemporary newspaper accounts, there may not have been much published in The Times, but the explosion was certainly reported in other newspapers. For example, you can find in the British Newspaper Archive a detailed four-column account that was published the following Monday (22 Jan, p. 5) in the Western Daily Press from Bristol. This seems to have been mainly based on Press Association reporting, and parts of the report also appeared in other newspapers at around about the same date. The main headline read: “The Great Explosion. Enormous Damage Reported. Some Heartrending Scenes.” – and some parts of the report still make gruesome reading today. The report, however, doesn’t mention Silvertown at all, which may explain why your searches of the Times Digital Archive did not find anything relevant (the key phrase used in the reports is: “in the East End of London”). 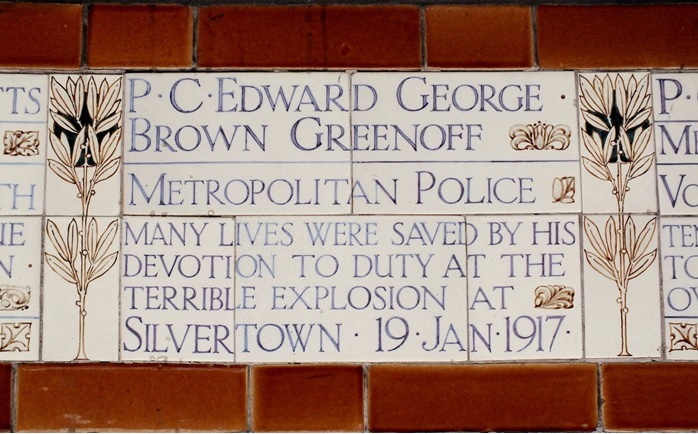 In the BNA, there are 113 items published between 22 and 28 January 1917 that contain the phrase “great explosion” – the vast majority of these would appear to refer to the “terrible explosion in Silvertown” and its aftermath. Fascinating – thank you for contributing your knowledge!